← Live to 100? No thanks! I have no idea who wrote these words. If any of y’all know, will you tell me? This quote spoke to me, though, at some point, because I wrote it down, and today as I cleared off my desk I found it. Scrawled on a scrap of paper and placed in my “I’ll get to this later” pile, the quote has lingered, waiting for me to get to it. How very patient. I’m pretty sure I didn’t write it (although I wish I had). Perhaps it spoke to me because of the idea of having to mother myself. Being a motherless daughter, I don’t often think about mothering myself, and yet I do. Making myself go to bed when instead I want to stay up all night reading my current favorite book. Being diligent about pulling that load of shirts out of the dryer and hanging them up instead of letting them sit indefinitely in a wrinkled heap. Wiping up the spills on the stove top now, not later, before they’ve hardened into an indeterminate glob of laminated goo. In the early days of navigating life without my sweet mama, I actively avoided any mothering that might come my way. That hole in my heart was too new, too raw to allow anyone else to even attempt to approximate any of the things my mom did. Seven years later, I still eschew any overt mothering. Somewhere along the way, though, I must have started mothering myself a bit. I certainly don’t hold out any hope that the hurts can really be kissed away, although I do tell myself often that bad things just happen. Telling myself that doesn’t help my innate desire to question, to wonder about the reason, or to pick things apart in a futile effort to figure them out. Sometimes it just is. Writing about the things, whether the bad things or the confounding things, does help. Perhaps that’s the line that most spoke to me in the above quote. Perhaps that’s the reason I jotted the quote on a scrap of paper and put it in the pile on my desk. I’m a big believer in writing as healing, which I why I sit in front of my computer, keyboard clacking away as the words fill the screen. For me, just getting the words out of my head and the thoughts onto the screen is therapeutic. Knowing that I can drown out the insomnia-inducing worries with the “morning voices” is sublime. It borders on miraculous. Your description of writing hits home with me. Keep it up Pink! i LOVED this post – you wrote so eloquently about the need we all have sometimes of mothering ourselves. my mom is still living, but since my dad died 5 years ago, has been in a miasma of grief and depression, no longer able to be the beautifully vibrant, engaged, and magnificent mother she has always been. oh, how i miss her. now i mother her as best i can, and also have turned to mothering myself. it’s a skill that has provided comfort and reassurance and a balm to the raw pain of loss of that precious woman who now lives in a place i cannot get to. your thoughts about the thereputic effects of writing also resonated with me. 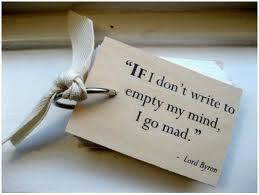 when so much is swirling about and seems to overwhelm one, writing is a way to clarity and truth. i like the quote by mr. bradbury, too. i am so glad that you’ve found your way through from insomniac worrying to those lovely morning voices. thank you so much, pink. this is a beautiful and insightful post, a glimpse into your very personal part of the journey so many of us share. Oh, Karen! I’m so sorry to hear about your dad, and sorry to hear that your mom is mired in grief. It’s so sad when we reverse roles with a parent, and for you to have to mother your mom and yourself is too much. Your words about your mom moved me very much and will stay with me. Excellent post! Being maternal towards myself does not come naturally. Writing, however, does. I guess that’s part of the beauty (and the lure) of the blog; in the reading of others’ (and in the writing of my own), there is great comfort. Especially late at night, when the boogie-man cancer thoughts creep out. I always love reading your blog, Renn, and am glad mine does for you what yours does for me. This is exactly why I write. Not every word makes it out to the public but it getting it down takes it away from my active worrying and thinking. It is healing. Mandi, I haven’t seen a new post from you in a while…I’m assuming that means all is well. Aww, Tori! What a nice thing to say. Thank you! Great quote, right? Glad you like it, Catherine.